This has been a busy summer for me, as my regular readers may have guessed due to my infrequent posts, so it may come as no surprise that there is big news in my future. I will be submitting my Ph.D. dissertation in the next week or two (in environmental engineering, if you were curious), which will be the culmination of a wonderful six-year journey filled with hard work, great challenges and successes, fantastic friendships, and some very fond memories. In the beginning of September, my wife and I will be uprooting from California and embarking on a cross-country road trip to the Boston area, which will be our new home. While I do not yet have a position lined up, I am excited at the prospect of beginning my professional career in conservation there. I hope that I’ll be able to continue to find time to photograph wildlife in the Northeast, and I will definitely be keeping the blog as active as I can. I have plenty of images from California waiting to be posted, but I suppose I’ll need to come up with a new tag-line for the blog, since I’ll no longer be "seeking inspiration from the natural beauty of just northern California." Also, if you have any favorite bird or wildlife locations in Massachusetts (or the surrounding area) please let me know in the comments or by email. I’m definitely looking forward to finding some new wetlands, forests, and beaches to explore! On our travels to the east, we’ll be spending around a week in Yellowstone & Grand Teton National Parks – two places that I have never visited, but that have been on my wish list for a long time. I’m looking forward to the wildlife photography opportunities there, and my wonderful bride has already agreed to wake up well before sunrise each morning so we can seek out wildlife during the golden hours. I probably won’t have too much of a chance to blog while we’re on the road, but hopefully I’ll come back with plenty of images to post throughout the fall! For the next few weeks, I’ll continue to post new images whenever I get the chance while I wrap up many loose ends here before the move, including squeezing in as many trips to Point Reyes National Seashore as I can! As always, thank you for taking the time to read my blog and for your comments and support over the past few years! Hello Pat, So you'll be moving over to my side of the country. I grew up in New Bedford, a quaint fishing port on Cape Cod and moved to Maine about 8 years ago. I love New England. Congratulations on completing your PhD dissertation. Wow! Safe travels to you and your wife. I will look forward to snipets of your journey as you are able to post from time to time. God bless! a new chapter in your lives! i certainly hope it will be a great one. good luck on the travels and move, and ultimately on finding a perfect position for your career! Best wishes on your new venture, Pat. Gee, I guess this mean Point Reyes is all mine now. Yikes! Best wishes on your dissertation, Pat. Our office just lost a research associate to Boston, and now you. Sad times! I'll be looking forward to seeing what you find Out East! You'll be missed out here Pat. It would be nice to get together one last time before you head east. Also, if you have any questions on Yellowstone let me know. Wow, that is quite a move! I am sure you are going to have a wonderful journey getting there. It will certainly be interesting to read about your new discoveries on the east coast. 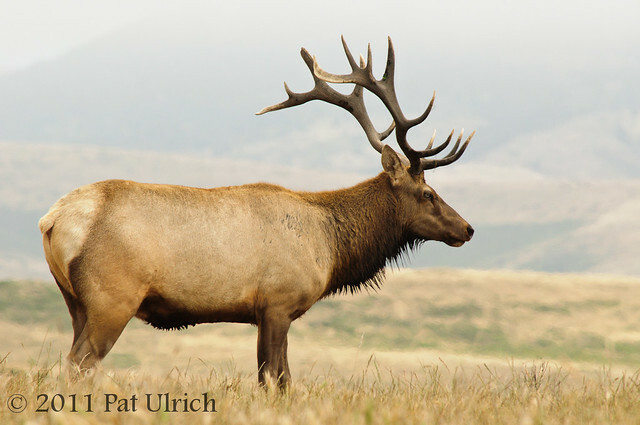 Love your recent elk shots Pat. I see a new wardrobe in your future, plus a snow blower and an exorbitant heating bill. Good luck in hour new ventures, Pat, and congtatulations. Thanks again for your support and kind words, Iain! I have plenty of images from California still waiting to be processed and posted, but I am definitely hoping to find the good wildlife sites in the area and transition to a blog more focused on the Northeast. Stay tuned! Thanks, Carol! I am very excited to have new places to explore in New England. Do you have any favorite parks? Thanks, John! I think you may have to share Point Reyes with Jim Coda, but please do take great care of it! I'm still not quite sure what I'll do without having that park so close. Thanks so much, John! There is a definitely pull to Boston for many people -- it seems like almost everyone I've talked to recent has spent some time living there. Once we get settled in a bit, I'll be looking for the best wildlife parks in the area. And it goes without saying that I'm really looking forward to visiting the Bay Area parks vicariously through your awesome blog! Thanks so much, Jim! I'm counting on your blog to give me my regular Point Reyes fix after I move ;-) It would be great to meet up again for a cup of coffee or lunch. I'm not sure how many more times I'm going to make it to Marin, but I'll send you an email once I have an idea of my Point Reyes schedule in the next 2 weeks. Thanks, Mark! We're really looking forward to the trip! It really is fun to see the whole country from coast to coast, and I'm so excited to spend some time in Yellowstone and Grand Teton!